I’m a fan of churches not owning locations and being portable. I know there is a stigma amongst church leadership types against mobile ministry but I really do think churches that have permanent locations are the ones missing out! If you are looking at launching a new location for your church here are some advantages of going portable in that new location. Maybe you are a church planter wrestling with how hard it’s going to be mobile … here are some positive advantages of being portable! Heck! … maybe you lead in one of those “old school permanent location churches” … here are the reasons you should sell it and go portable! Redeeming Public Space. // We live in an increasingly post-Christian culture. “Holy buildings” scare people. Rather than ask people to “come to us” portable churches get to “go to them” and use spaces that are used throughout the week by the people you are trying to reach. The church is suppose to in the culture and making a difference and being mobile takes that Biblical imperative and makes it tangible! Lighter & Quicker Footprint. // You can pull the trigger on getting in (and possibly out) of a community faster when it’s portable location you are looking at. You can measure the time to open a new location in weeks not months and years. If this campus or location of your church isn’t working out for some reason … you can pull your resources out of that community and attempt a ministry in a better location. Activate New Volunteers. // At the heart of the portable church experience is a group of dedicated volunteers who set up and tear down all the equipment to do this. At one of our locations we moved from being portable to being permanent and it was a real loss when these core team members lost a way to serve that they loved. Portable churches engage more volunteers and a wider spectrum of people serve on their teams. Lower Cost Per Guest. // Do you know how much it costs to build or renovate church space per person? Often it costs between three to ten times more to host the same number of guests in a permanent church facility than a rented location. One of our campuses is meeting in a theater right now that easily cost 3-4 million dollars to build … I’m happy we’re just renting it weekly rather than worrying how to pay for it! Fluid Space Usage. // As your the needs of your church grows and changes you are able to match your facility usage to those needs. Need more space for adults to sit … move to a bigger room! 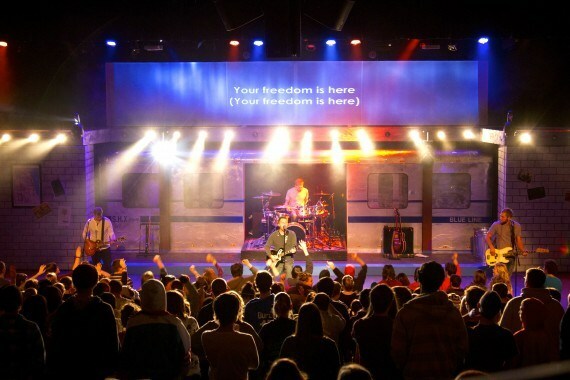 Your student ministry is thriving and bursting at the seams … find a different space for them. Want to try a new Sunday morning class for adults … just rent a space for a few weeks and see what’s happens. When you build a permanent location it’s … permanent. Community Partnerships. // Because you are going to be meeting in a space owned by someone else you need to work on partnerships in the community. This posture is a the right place for the church be in. An active part of your role is going to be managing those relationships and it pushes us to see ourselves as a part of the community rather than distant from the people around us. Are you a portable church leader? I’d love to hear your thoughts or stories on why being mobile is effective ministry! In regards to partnerships, we’ve been able to form great relationships with the theater employees…To the point where one of them considers us their church and another one I was able to perform his wedding. Great opportunities. So great! Love bumping into “long time portable” folks too! What would you say have been the key to forming those relationships? I believe it begins by seeing it as a true partnership. That takes time and being intentional with developing the relationships. When issues come up, sit down and communicate. If they have needs, try to see if you can help meet them. I think another big piece is the gospel and truly loving your neighbor. I’m thankful for the way our church has done that, which has led to further ministry opportunities with the theater staff. Though a year old, great post and great feedback Jon. Churches often look at the sphere of influence of a location and forget the most immediate sphere may be the venue’s employees, landlord, or the employees of the shops in the mall. Who is a church that is doing a great job of theater church? Good piece (again!) Rich. Due to maintenance at the mall we usually use, we had to switch sites for our campus on Sunday. We had some Welcome Team people at the usual location, and a father and son asked what sort of church met in a movie theater. He must have liked the answer, because he said he’ll be back. Also, it seems to me that using rented facilities is just better stewardship. Thanks again for the always interesting content. How long are you out of your main facility? Any lessons learned from moving to a temporary location? Thanks again, Russ! Have a great weekend. I love being portable because it presents a natural transition for emphasizing the church is about the people, not the building. This is a huge paradigm shift for the rural community in which we have planted ourselves. In a rural context … what have you found as great locations for you to rent and use? You nailed it. Depending on the location, there can certainly be others, too, but the need for getting a good start might be the best strategy of all. Thanks for a great article on a favorite subject of mine! You’ve seen a lot of cook locations on your work! What have been some of the most memorable? @craigsider: @richbirch great article. I’d add – able to morph ministry. i.e. willow creek ministry has to consider the facility they steward.